The patient is a 22 y.o. male who presented to our office with a chief complaint of odontalgia in the left mandibular molar region. The patient has no allergies. There are no serious illnesses. 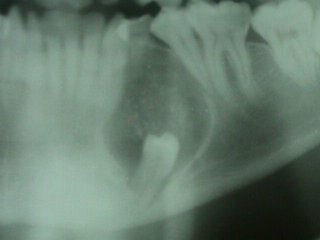 Incidental panoramic radiographic findings revealed a left mandibular radiolucent lesion with associated impacted tooth # 21 and an over retained left mandibular first primary molar. The radiolucent lesion was well-delineated with calcific flecks. Roots of teeth #'s 20 and 22 were divergent. Tooth # 21 was at the inferior border of the mandible. 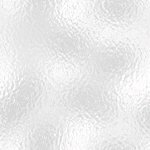 Teeth #'s 1, 16, 17, and 32 were noted to be impacted. Carious lesions were noted in teeth #'s 2, 14, 15, 19, and 31. Tooth # 30 was missing and was extracted by his general dentist in 1997. Oral examination revealed a Class II malocclusion with anterior-posterior incisor discrepancy and anterior open-bite. Gingival erythema was diffuse. 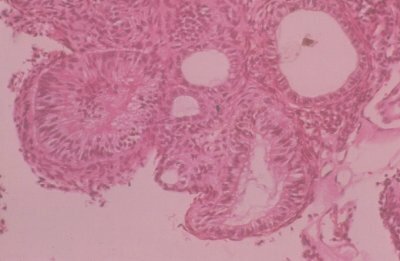 Expansion of the buccal cortical plate was noted, however no bruit or thrill was present. There was no paresthesia of the mental nerve. 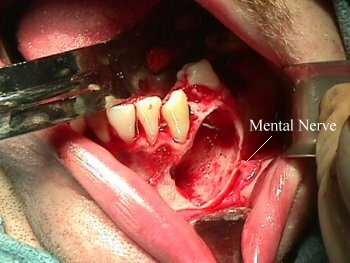 Extraction of Teeth #'s 1, 16, 17, 19, 21, 32, and L.
Expansion of buccal cortical plate. 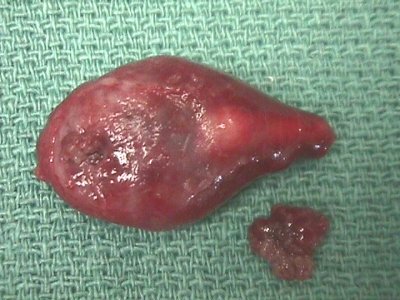 Tumor with material from lumen. Osseous defect with intact mental nerve.